"Be the leader. Deserve a place in the CHFI certified elite class. Earn cutting edge skills in computer forensics"
"If you desire to acquire the knowledge or skill set to identify, track and bring the cyber criminals to justice, then this course is right choice for you"
EC-Council releases the most advanced Computer Forensic Investigation program in the world. CHFIv8 presents a detailed methodological approach to computer forensics and evidence analysis. It is a comprehensive course covering major forensic investigation scenarios that enable students to acquire hands-on experience on various forensic investigation techniques and standard tools necessary to successfully carry-out a computer forensic investigation. Battles between corporations, governments, and countries are no longer fought using physical force. Cyber war has begun and the consequences can be seen in every day life. With the onset of sophisticated cyber-attacks, the need for advanced cyber security and investigation training is a mandate in the present day. If you or your organization requires the knowledge or skills to identify, track, and prosecute the cybercriminals, then this is the course for you. This course helps students to excel in digital evidence acquisition, handling and analysis in a forensically sound manner. Acceptable in a court of law, these skills will lead to successful prosecutions in various types of security incidents such as data breaches, corporate espionage, insider threats and other intricate cases involving computer systems. CHFIv8 contains updated information including concepts, methodologies and tools. The well-organized content enhances the learning experience and ensures better understanding of key concepts and investigation methodologies. CHFIv8 presents step-by-step procedures, best practices and guidelines to carry out forensic investigation. Concepts are well-illustrated to create self-explanatory slides which makes it classroom and instructor friendly. 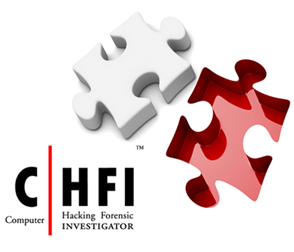 CHFIv8 provides in-depth knowledge of new techniques and tools used in forensic investigation to meet the toughest challenges in fighting cybercrime. CHFIv8 showcases hundreds of investigation tools including EnCase, Access Data FTK, and ProDiscover. CHFIv8 DVD contains a huge cache of evidence files for analysis including RAW, .dd images, video and audio files, MS Office files, systems files etc. Use of rich Visual Content Technology to present concepts and forensic investigation techniques. Lab setup manual provides detailed procedures to setup a lab environment complete with network environment, evidence files and other prerequisite tools. CHFIv8 also provides a DVD-ROM with a repository of the around 8 GB of the latest investigation and security tools. and student manual in CHFIv8 empowers the instructors with flawless flow and outstanding diagrammatic representation of the investigation techniques, which makes it easier to teach and enables students to understand the concepts. "The CHFI Certification is L SEP an incredible asset to my company which has now a better understanding of Security issues, especially concerning vulnerability." - Frank Chow, CHFI, Automated Systems (HK) Ltd, China. you need is a web browser to connect and start experimenting. The virtual machine setup reduces the time and effort spent by instructors and partners prior to the classroom engagement. It is a hassle free service available 24/7 x number of days subscribed. Different types of digital evidence, rules of evidence digital evidence digital evidence examination process, and electronic crime and digital evidence consideration by crime category. Roles of first responder, first responder toolkit, securing and evaluation electronic crime scene, conducting preliminary interviews, documenting electronic crime scene, collecting and preserving electronic evidence, packaging and transporting electronic evidence, and reporting the crime scene. Data acquisition and duplication rules, validation methods and tools required. How to recover deleted files and deleted partitions in Windows, Mac OS X, and Linux. Password Cracking Concepts. Tools, types of password attacks and how to investigate password protected files. How to investigate logs, network traffic, wireless attacks, and web attacks. How to track e-mail and investigate e-mail crimes. "The course material is up to date and very complete. It really takes you on a trip through the Security field. Each chapter has lab exercises and this makes you understand the stuff in the book much better. If you are working or want to work in the Information Security field this training is highly recommended." Martin de Kok, Sr Security Officer, Netherlands. CHFIv8 curriculum consists of 22 instructor-led training modules.